And the last shall be the first. Although not much was made of it, the last NBA champion, the Warriors, also won the league’s first title. So the Warriors span the NBA championship bridge from the first in Philadelphia to the last in Golden State. The year was 1947. Less than two years after the end of World War II, Harry Truman was President, The Best Years of Our Lives won the Academy Award for Best Picture, Jackie Robinson broke baseball’s color barrier,and ENIAC, the world’s first electronic digital computer, was turned back on after being shut down for a nine-month refurbishment. And the Philadelphia Warriors won the championship in the inaugural 1946-47 Basketball Association of America (BAA) season. Following the 1948–49 season (the BAA’s third season of play), the BAA and the National Basketball League merged to form the National Basketball Association (NBA). The Warriors championship is considered the first NBA title. Eddie Gottlieb coached the Philadelphia five that year and forward Joe Fulks won the NBA’s first scoring crown, averaging 23.2 points per game. Fulks, who joined the Marines in 1943 and served in the the South Pacific, scored 37 points in Game One of the Finals, including 21 in the fourth quarter, to lead the Warriors to an 84-71 win over the Stags. Jumpin’ Joe is #18 in the team picture above. Philly won the next two games, and wrapped up the series in five when forward Howie Dallmar snapped a tie by nailing a jump shot with less than a minute remaining to give the Warriors the lead for good in an 83-80 victory. Fulks led all scorers with 34 points in the clincher. Led by Paul Arizin, Neil Johnston and Tom Gola, the Philadelphia Warriors also captured the 1956 NBA championship, beating the Fort Wayne Pistons in five games. Following the 1961-62 season, Wilt Chamberlain and the Warriors moved to San Francisco. Later renamed Golden State, the Warriors swept the Washington Bullets in the 1974-75 NBA Finals. Hall of Famer Rick Barry averaged 30.6 points per game for Golden State that season. In addition to their four championships, the Warriors lost three NBA Finals, to the Baltimore Bullets in 1948 while representing Philadelphia, and in 1964 to the Boston Celtics and 1967 to the Philadelphia 76ers, both while playing in San Francisco. Al Attles, a lifelong Warriors guard, played in both Finals and later coached Golden State to the 1975 NBA championship. If you liked this blog, you might like: The 1947 Holy Cross Crusaders were another great basketball team. Read the SportsLifer – Holy Cross was Once King of Hoops. Name a great one. Babe Ruth. Ted Williams. Jim Brown. Tom Brady. Wayne Gretzky. Oscar Robertson, Michael Jordan. The list goes on and on, but no athlete in the history of professional sports ever had a more dominant game — and a more dominant year — than Wilton Norman Chamberlain, playing for the Philadelphia Warriors in 1961-62. The crowning achievement of Chamberlain’s year (and his career) occurred on March 2, 1962, when Wilt scored 100 points against the New York Knickerbockers. The ‘Game of the Century” was played before a half-empty arena with 4,124 in attendance in Hershey, Pa. The contest was not televised — in fact no footage of any kind exists. Not a single New York sportswriter was there to write about it. There were only two photographers on hand, and one of them left after the first quarter. Veteran broadcaster Bill Campbell broadcast the game over WPHT radio in Philadelphia. In addition to his 100 points, Wilt established single game records that still stand for field goal attempts (63), field goals made (36), and free throws made (28 on 32 attempts), mind-boggling for such a terrible foul shooter. No NBA player has ever come close to approaching 100. Kobe Bryant scored 81 points in 2006. David Robinson had 71 in 1994. Michael Jordan scored 69 in an overtime game. Pete Maravich once scored 68 against the Knicks. 1. 50.4 PPG: Chamberlain scored 4,029 points and averaged 50,4 points a game during the 1961-62 season, coming off a 44.8 scoring average the previous year. In the 50 years since, Michael Jordan’s 37.1 ppg in 1986-87 is the NBA high water mark . 2. Scoring Streaks: In 1962, Wilt scored more than 50 points 44 times, more than 60 a dozen times and more than 70 twice. In December of 1961, Chamberlain had five straight games of 50, including a then-record 78 against the Los Angeles Lakers. Later that December, he scored 50 or more seven times in a row. He had another streak of six straight 50+ games in January of 1962, topped by 73 against the Chicago Packers. 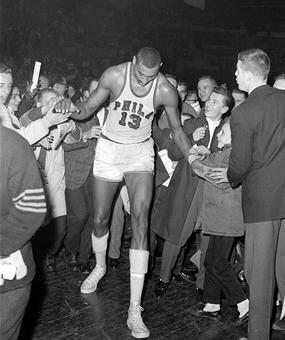 Wilt scored 67, 65 and 61 in the games leading up to 100. And two nights after 100, Chamberlain torched the Knicks for 58 at Madison Square Garden. 3. Rebounds: Wilt averaged 25.6 rebounds per game that year, third best all-time behind his own best 27.2 in 1960-61 and 27.0 in his rookie year, 1959-60. 4. League Leader: Chamberlain led the NBA in at least 10 major categories in 1961-62, including minutes played, field goals, field goal attempts, free throws, free throw attempts, total rebounds, points, minutes per game, points per game and rebound per game. 5. Minute Man: Wilt played every minute of every Warriors game that year, and averaged more than 48 minutes per game (48.52), the only time that’s ever been done. In fact, the top seven seasons of minutes played all belong to Chamberlain, who never fouled out of an NBA game. 6. All-Star Game Record: He set new standards in the NBA All-Star game that year with 42 points and 24 rebounds. But Bob Pettit of the host St. Louis Hawks won the MVP as the West beat the East, 150-130. 8. No MVP: Despite putting together the greatest statistical season in NBA (and arguably pro sports) history in 1961-62, Wilt Chamberlain did not with the MVP. That honor went to his rival, Bill Russell. Wilt did win four NBA MVP awards. 9. NBA Leader: Chamberlain won the NBA scoring title his first seven years in the league, beginning with his rookie year in 1959-60. He led the league in rebounds 11 times in 14 seasons, and even won the assist title in 1967-68. He won two NBA titles, with the 1966-67 Philadelphia 76ers and the 1971-72 Lakers. 10. On the Record: The record books are heavy with Chamberlain’s accomplishments. In addition to what’s been outlined above, he holds the NBA record for most consecutive field goals (18), most rebounds in a game (55), most games with 50+ points (118); most consecutive games with 40+ points (14) most consecutive games with 30+ points (65), most consecutive games with 20+ points (126), highest rookie scoring average (37.6 ppg) and highest field goal percentage in a season (.727).